Understanding other cultures will expand our ability to appreciate our own culture, and realize that local themes may not be universal, but are unique to this area. Through use of values, habits & routines, and performance capacities we can compare diverse cultures to our own, and through that become more accepting of other’s differences while celebrating our lifestyle. 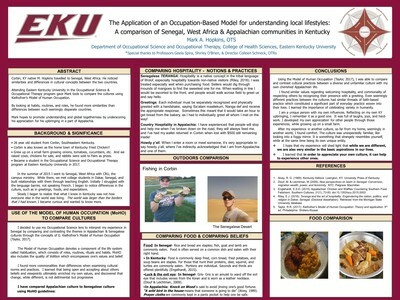 As an Occupational Science & Therapy Student at Eastern Kentucky University, use of Occupation-based models provide a framework with which to observe and analyze components of individuals, communities and populations in order to provide client-centered interventions. The Occupation-based model chosen was the Model of Human Occupation which identifies three major areas of life style activities with which to compare two diverse cultures. Volition was explored through the values and beliefs of hospitality and of honor in both communities. Habits, routines, and rituals were explored by comparing each culture’s manners and their greeting rituals. Performance capacity, or one’s physical abilities, were compared by viewing differing attitudes and approaches to fitness. By applying the MOHO model to two diverse cultures, it was found that this is a successful tool to analyze and interpret how cultures function and use practical, moral and societal codes. 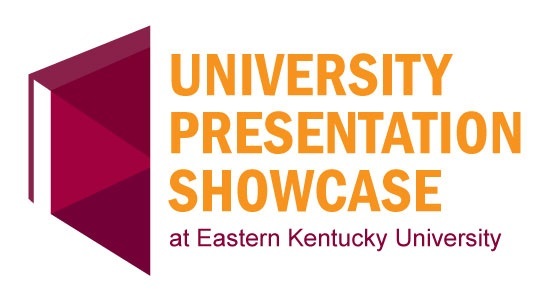 It is hoped that by understanding how Kentucky is both unique and universal, the Commonwealth will be able to maintain its unique identity while integrating into the diversity of the greater national and international communities.